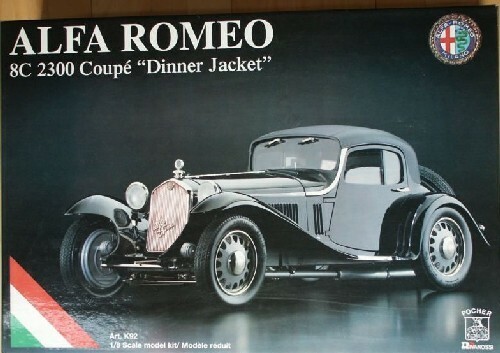 Pocher K92 Alfa Romeo Coupe Dinner Jacket 1/8 scale model kit! This is one of the rarest Pocher models and it builds to a beautiful and most interesting subject. In order to simplify the model somewhat, Pocher replaced the spoke wheels that are present on all other Alfa models with a plastic wheel that gives a completely different, and more contemporary look, to the model. These wheels must have been quite splashy in their day.